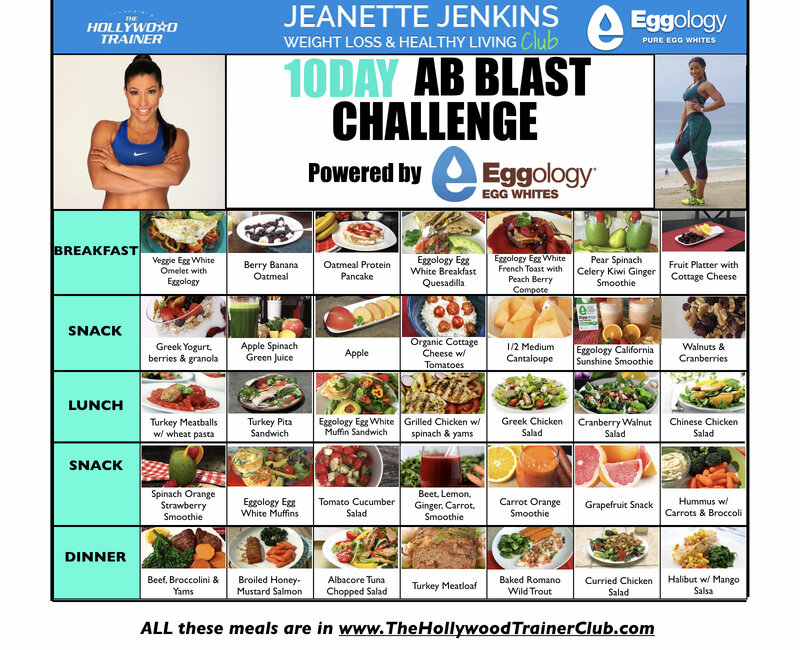 Summer is just around the corner and with the help of our friends from Eggology we have put together a 10Day Ab Blast Challenge that will start Monday, May 1st! The purpose of this challenge is to encourage you to commit to 10 days in a row of total body workouts with an extra emphasis on the abs! We have incorporated Cardio, Sculpting, Exercise Ball, Pilates, Running, Sprint Intervals, Kickboxing, Yoga, Strength Training and Sports Drills to challenge your core for maximum results. By using various methods of training that use your abdominal muscles in all the planes of motion the body will be consistently challenged over the next 10 days to help you achieve incredible results. Everyone can commit to 10 Days, it’s only 10 Days, your momma, your auntie, your sister, your brother, everyone can do this challenge. All of our workouts offer instruction for beginners to advance so everyone is welcome. Let’s get started! This healthy meal plan is low in sugar and balanced with protein, healthy carbohydrates and healthy fat to give your body the nutrients needed to function at your best, burn fat and feel great! All of the recipes in this meal plan are in The Hollywood Trainer Club. To simplify your meal prepping process, start by just picking two or three of your favorite breakfast lunch and dinner meals to get you through the week. It’s perfectly fine to repeat your favorite meals two or three times in a week. Do what works for you but let’s keep it healthy. Mark your calendar we’re starting May 1st! Wednesday, April 26th at 5pm PST/8pm EST join Jeanette for a Facebook Live 15min Q&A and 15min Ab Blast Powered by Eggology. Post a message on the Community wall in the club and let us know that you’re joining us for the 10 Day Ab Blast Challenge Powered by Eggology! We can’t wait to hear from you!